Symphony No. 3 In E flat Major Op. 55 "Eroica"
Symphony No. 6 In F Major Op. 68 "Pastorale"
Note on back cover of each disc: "A performance of the highest interest for Beethoven lovers: ARTE NOVA is the first label to produce all of the Beethoven symphonies based upon the new critical Bärenreiter Edition by Jonathan Del Mar on modern instruments, under the baton of a world-class conductor." 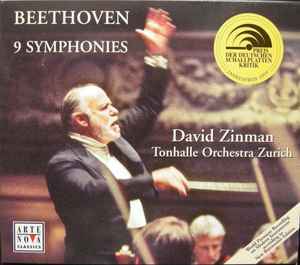 David Zinman on his reasons for including an alternate version of the 4th movement in this recording: "Reading through Jonathan Del Mar's 'Revision report' I came across a notation referring to Beethoven's original autograph copy, and a place in which he had written a General Pause between bars ... just before the word 'Bruder'. In later performance editions Beethoven had crossed this out and performance practice has remained the same ever since. For this reason, since we are referring to the original manuscript, it is interesting to hear this passage as it was originally conceived. Why Beethoven chose to make this change is not clear, but we have become so accustomed to hearing it this way, that we we cannot imagine it otherwise. At the same time, this gives an indication hof how a musicologist's work can stimulate one's fantasy." Slipcase has tiny nudge on corners.